ISLAMABAD: Police has arrested several PPP workers on wednesday ahead of the pre-scheduled appearance of former President Asif Ali Zardari and party chairman Bilawal Bhutto Zardari before National Accountability Bureau in Fake accounts Case. The workers gathered to express solidarity to their leaders. Leader PPP Qamar Zaman kaira said that around 200 workers have been arrested by the police. Roads leading to NAB headquarters were earlier blocked to keep the workers at Nadra Chowk. Police alleges that the workers started pelting stones at the police officers who were trying to stop them leaving at least one of the officers injured. 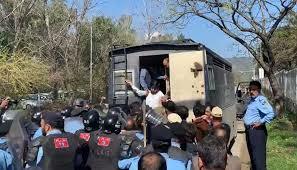 Police has also used baton-charge to disperse the mob which crossed Nadra chowk and reached the NAB’s head office. PPP leader Saeed Ghani, present among the workers outside the NAB headquarters, stated that his party only want unbiased accountability. He also condemned the police arrests of workers and demanded their immediate release and strict action against police’s alleged assault on their workers. NAB has prepared a list of 100 questions to inquire Bilawal and Zardari in reference to their link to the Park Lane Estate probe in the fake accounts case. The case was transferred to Islamabad last week from a banking court in Karachi summoning zardari and Bilawal To NAB’s head office in Islamabad on March 20.